This project aims at investigating if there are opportunities to design eco-visualization tools for children at home. Eco-visualizations are one way to promote sustainable behavior by providing the home dwellers with live information about their water and electricity consumption. In this nascent field, most of the literature explores adult behavior, needs and response, but children are often left apart. We used the drawing-telling technique to ask children about their current house and the sustainable activites, as well as an ideal sustainable house. 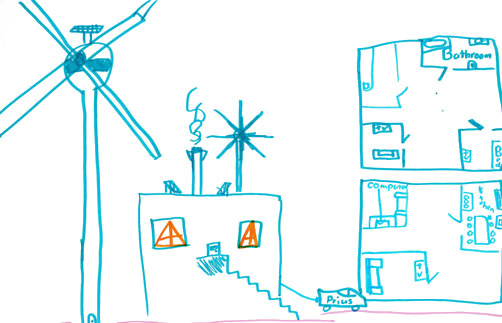 Drawing of an ideal sustainable house by a 10 years old. For this child, to be environmentally sustainable meant to forget about technology, and to return to a simple way of living. This participant used many technologies to enhance the sustainable character of this house. Wind and solar energy are used, and an electric car helps the family be more environmental friendly. _ Desjardins, A. and Wakkary, R. (2011). How Children Represent Sustainability in the Home, In Proc Interaction Design for Children (IDC) 2011, New York, ACM Press, pp 37-45. _ Desjardins, A. and Wakkary, R. (2011). 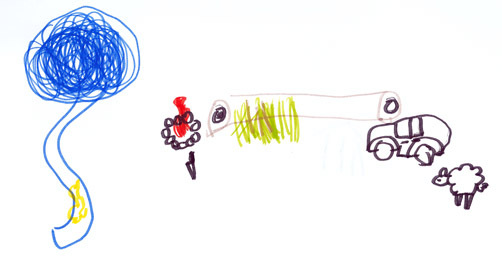 Children's Drawing and Telling of Sustainability in the Home, Proc EA CHI 2011, New York, ACM Press, pp 1411-1416.